We are currently growing only enough produce for our own consumption, but once we have a little more experience with the pros and cons of the different techniques we will be selling the surplus at local farmers markets and possibly via a community supported agriculture scheme. 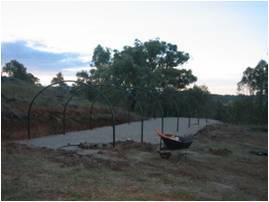 Our vegetable garden was designed on inspiration from Linda Woodrow via her book “The Permaculture Home Garden”. The term “mandala” comes from a Sanskrit word for circle and the garden is made up of six circular beds around a central circular pond. The thing that impressed us with the concept of mandala gardens was the way all the elements work together in a synchronicity that makes the whole much greater than the sum of the parts. 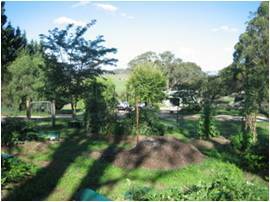 At the moment we are incorporating companion planting and crop rotation techniques to maximise productivity. Our small aquaponics system, originally set up as a pilot for the larger greenhouse system, comprises 4 grow beds (60 litre recycling tubs) and a 220 litre nutrient supply tank, which can either be stocked with fish, or a natural source of nutrient such as urea, seaweed concentrate, or worm tea. This system would easily fit on a balcony, back deck, or in a suburban backyard, and can provide a continuous supply of herbs and fresh vegetables all year round. 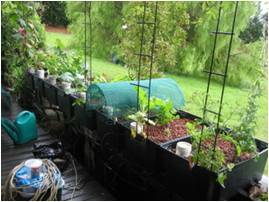 It has provided us with the experience and knowledge to build the larger aquaponics system. · a 6m x 0.8m x 0.4m sump (capacity of ~2000 litres) with 8 floating raft sections each containing 12 holes. Water is continuously pumped from the sump to the fish tank where it creates a swirling motion that simulates a slow moving stream. Water then overflows from the fish tank into the grow beds where it “floods and drains” back into the sump via syphons. So far we have grown a range of vegetables in the grow beds including beetroot, tomatoes, broccoli, red cabbage, perpetual spinach, mizuna, roquette, tatsoi, asian vitamin greens and herbs including basil and parsley. We have used the floating rafts mostly for lettuce to date, but will start to experiment with other vegetables as the rafts are capable of producing 24 lettuces each week!! From observation, it would appear that plants grown in the greenhouse aquaponics system grow at twice the rate of those planted outside in the soil. This is not surprising as they have continuous access to water and nutrients, and an environment sheltered from the extremes of wind and weather. Our shadehouse was completed in 2012 but with the hot summers it has been used as a sanctuary for many of the plants that were getting overheated in the green house and even outside! Wicking bed are currently on hold until we can clear more space in the shade house.